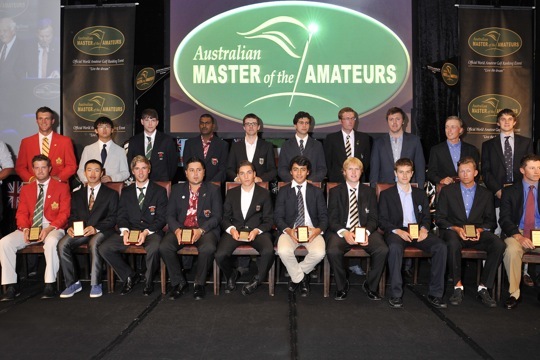 The Australian Master of the Amateurs championship represents our biggest amateur event of the season. A category ‘A’ Official World Amateur Golf Ranking Counting Event, the Australian Master of Amateurs is currently ranked at 17th on the R&A World Rankings. The championship is ranked by the R&A as the number one Australian Amateur Golf Event with the Australian Amateur our next ranked event further down at 57th. The championship will be played on the West Course of the Royal Melbourne Golf Club, from Tuesday 8th January till Friday 11th January and has attracted another stellar international field with players from USA, Germany, UK, China, France and Canada . World number four American Peter Williamson is the highest ranked player in the invited 54-player field – which includes seven of the world’s top-20 R&A ranked players – with Americans Brandon Hagy (12th), Patric Rodgers (13th) and our own Brady Watt (16th) all competing this week in Melbourne. Asian Amateur champion Guan Tianlang will make his second appearance for the event as he prepares to become the youngest player ever to play The Masters at Augusta next April. Australian marque players either to qualify of be invited include Todd Sinnott, Geoff Drakeford, Jordan Zunic, Chris Brown, Ben Clementson, Ricky Kato and Brett Drewitt. The event has already proved to be a prominent stepping stone in the golfing careers of Australians Jason Day and Brendan Jones and the US PGA Tour’s young gun, Rickie Fowler. Day won the title in 2006, Jones in 1999 and Fowler narrowly went down in fellow American Mark Anderson after a four hole play-off in 2009. The 2013 Australian Master of the Amateurs Champion shall receive exemptions into the British Amateur, Porter Cup, Players Amateur, Dogwood Invitational and the Canadian Men’s Amateur championships. Last year Nathan Holman fired rounds of 67-72-69-70 to finish at 10-under-par and a five shot winning margin over Daniel Nisbet. Holman in the process collected his fourth main amateur title in twelve months after earlier securing the Riversdale Cup, Portsea Open and Victorian Amateur. Royal Melbourne again provided the perfect test with just sixteen of the 54 invited players breaking or scoring par during the final round. Just five players bettered par for the four round tournament. Holman has returned to Royal Melbourne to defend his title. This year should again be no exception with the level of international talent unparalleled to any other amateur event in this country, making the Australian Master of the Amateurs the blue print for amateur events in Australia to follow.